Over the years, I’ve been to the Netherlands many times but only to step foot on the ground inside Amsterdam’s Schiphol Airport while heading to some other destination. My husband and I decided this time, we’d take one day to actually see Amsterdam. After two long flights from Boise, we arrived at Schiphol at 6:30am with a caffeine induced adrenaline rush stupor and only 24 hours to see the city. We had booked a hotel near the main central train station which was a quick 30 minute train ride from the airport. We arrived at the Bellevue Hotel and requested the earliest check-in possible. They laughed at us since most of the guests that would be checking out were still in their beds sleeping. Rather than anxiously waiting in the hotel lobby for the first unoccupied clean room, we headed around the corner to the nearest cafe ingesting even more coffee at $5.00 per cup (US currency). 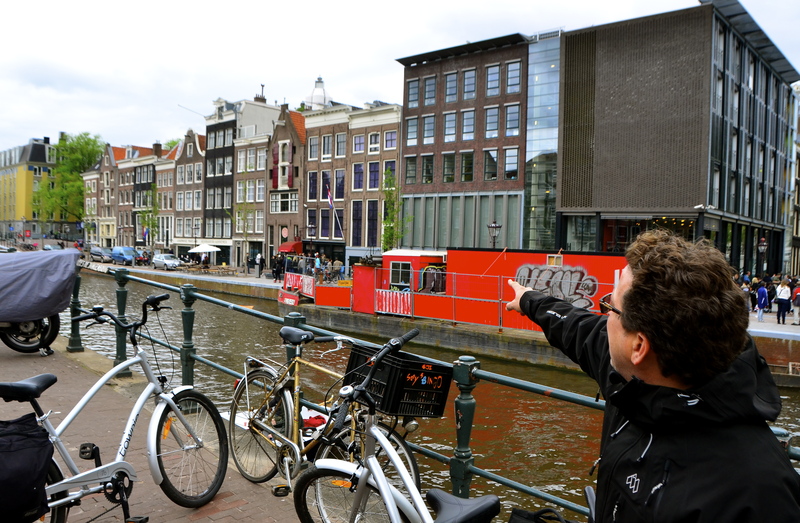 Unusually cold and windy weather for May, and not thinking of packing our heavy winter coats for this trip, we braved a brisk early morning walk near the hotel to get a sneak peek of Amsterdam before heading back to the hotel lobby to wait for our room and escape the cold. The Bellevue Hotel staff ended up being very accommodating and found us a room around 11am. Sleep deprived, we unpacked and decided to take a catnap before heading out on foot, south across town to meet our tour guide for the bicycle tour of Amsterdam that we’d booked before leaving Boise. 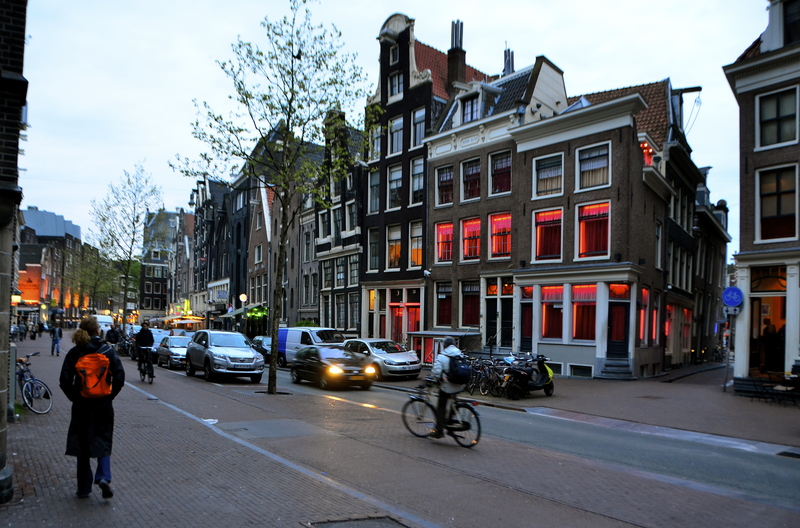 The Joy Ride Cycle Tours meeting place was near the Rijksumuseum next to the big red Amsterdam sign. While we waited for the rest of our tour group to arrive, our very friendly and knowledgeable tour guide Sean told us that he’s had to call ambulances twice for people hoisted up to the tall “I” sign that have fallen off while trying to figure out how to climb down. Sean suspected that alcohol might have been involved. 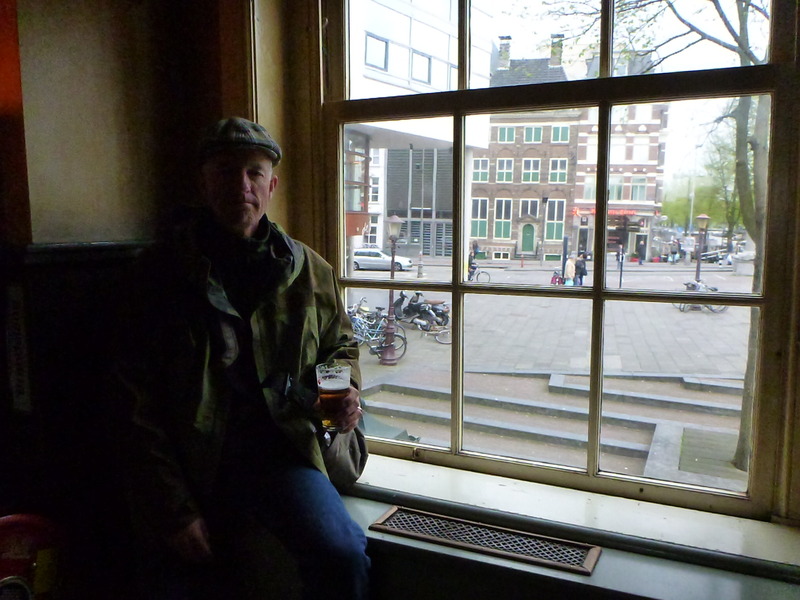 Towards the end of the tour, thirsty, we stopped into a cozy pub. 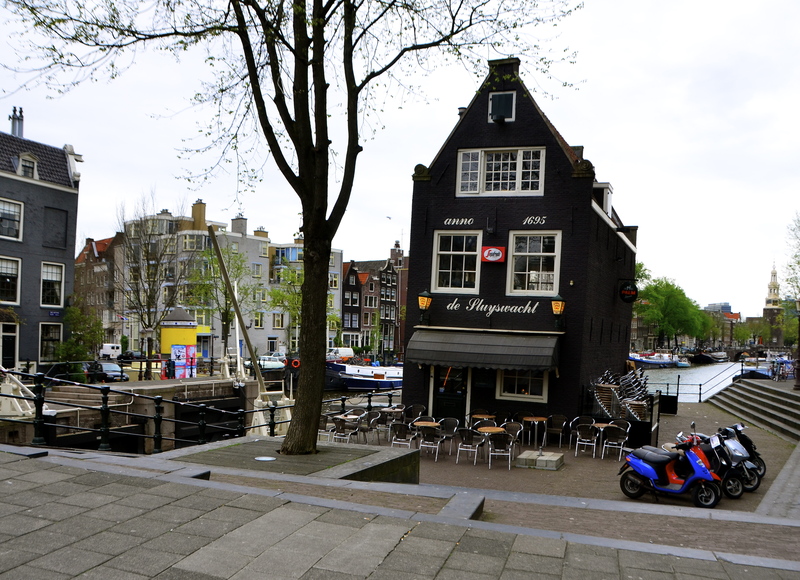 The slanting Café de Sluyswacht built in 1695 is located across the street from the Rembrandt House. We warmed up, chatted with our fellow riders and enjoyed a pint of one of the local dutch beers on tap. 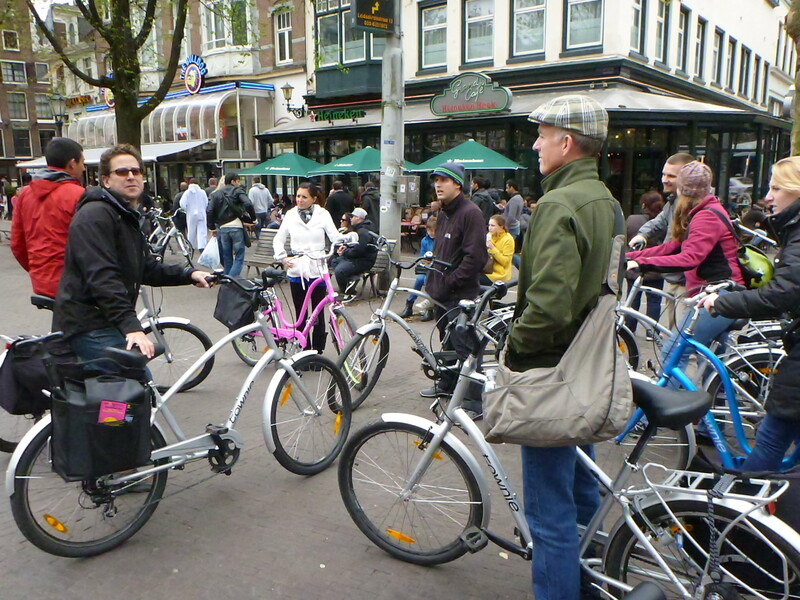 Our guided bike tour lasted about 4 hours and covered almost 10 miles with stops along the way to learn about the history of the city. What a great way to see the sights on such a short visit. Our tour ended back at our starting point, but, sadly it was over. 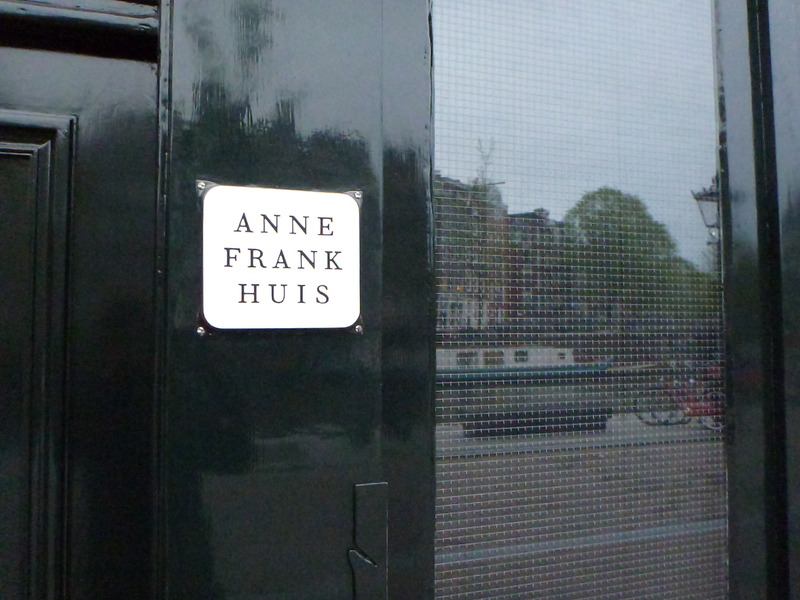 We said our good-byes and found our way back to the Anne Frank Museum but this time it was to see the inside. We had booked our tickets ahead of time to avoid waiting in line but at 8:30pm the crowds inside were still large. Last year the house had over 1 million visitors. The house is actually the former office building of Anne’s father Otto. He converted the office’s back rooms into their secret hiding place. It’s well worth visiting but plan on doing it when you can take your time. Hungry after visiting the museum, we found a great tapas restaurant called Joselito Tapas Café near our hotel. The staff there were super friendly, the service fast and the food good. It was a great way to end the evening. Exhausted after a long day of cramming as much in as we could, we looked forward to a full night of sleep before heading back to Schiphol. 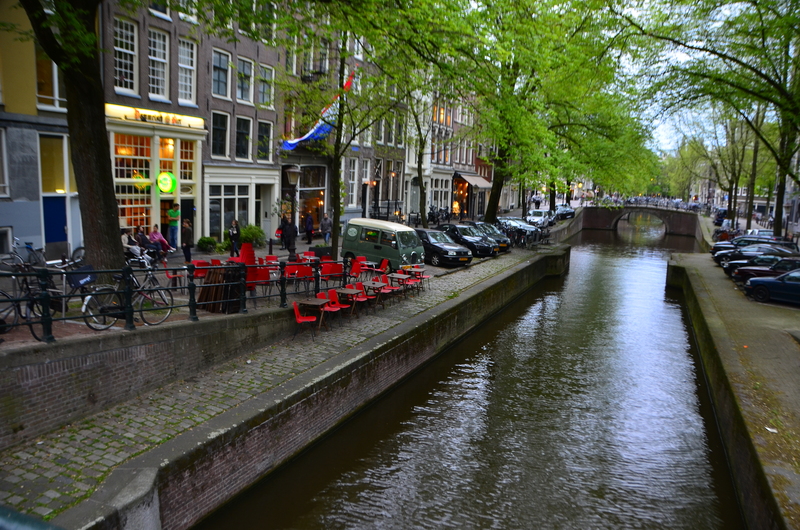 Our 24 hours in Amsterdam was full of good memories. These photos are amazing. 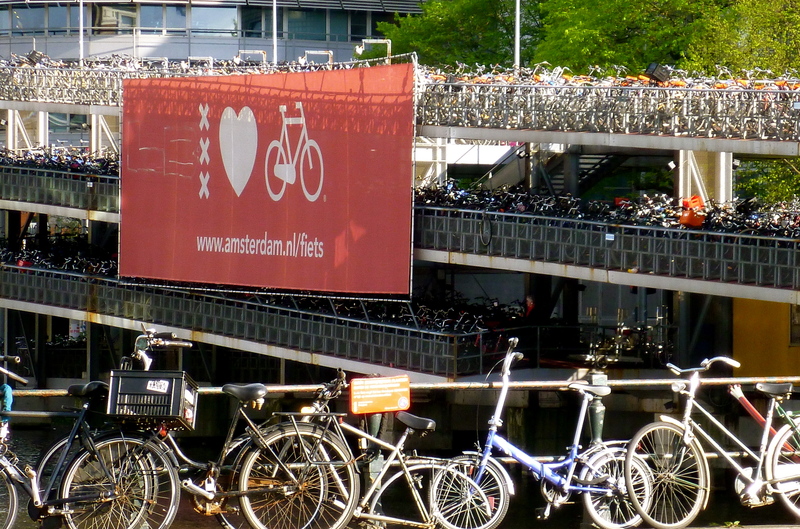 Amsterdam is definitely listed on my ‘places to go’.